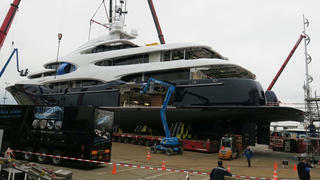 The 88.5 metre superyacht Oceanco Y715 has been spotted on sea trials off the coast of the Netherlands. 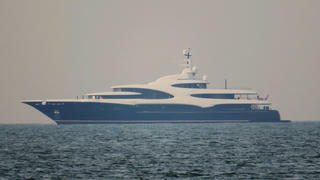 The four-deck displacement yacht was first spotted under her own power on January 25 as part of a four-day test. 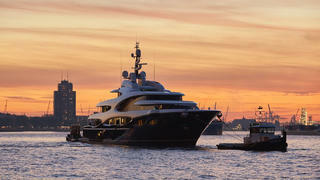 Exterior styling is by Australian designer Sam Sorgiovanni, while naval architecture is courtesy of Oceanco and Azure. Very few details are known for sure about this highly secretive new superyacht and its voluminous interiors, although it is understood that the steel hull supports an aluminium superstructure and teak decks. The dark blue hull contrasts strongly with the white superstructure, while a red waterline stripe adds to Sorgiovanni’s dynamic styling. Y715 is his third design for Oceanco, following on from Anastasia and Nirvana. In a statement, the yard said, "With no sharp edges, she has a very organic form with large elliptical-shaped hull windows that complement the curvilinear profile." A tender crane has been fitted to the aft of the superyacht sundeck, which appears to be the largest area for exterior relaxation. 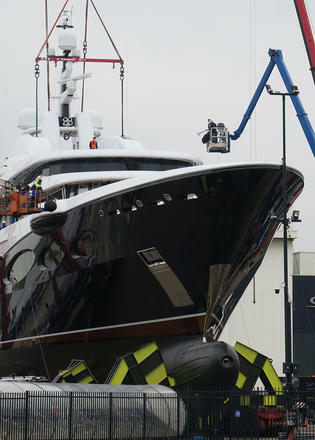 The engine installation is as yet unconfirmed but the hull has been designed to hit a top speed of 18.5 knots. Due to be delivered later this year, Oceanco Y715 will officially rank as one of the world’s largest superyachts, and one of the top ten largest launched by the Dutch yard so far. The new arrival follows hot on the heels of the 105 metre Oceanco Y712, also known as Project Solar, which is also due to undergo sea trials this month. The masts of this enormous Nuvolari Lenard-designed sailing yacht could be seen in the background when Y715 emerged from its shed back in October. Other projects currently under development at Oceanco include the 110 metre Y714, another Sorgiovanni design, which is being developed under the codename Project Jubilee and will become the Dutch yard’s flagship yacht when it is launched next month.